The most engaging apps built on our platform are apps that consistently provide value to the end user. From day 1 to day 1000, your app must have a compelling reason for a user to download it and continually stay engaged with it. So how do you create value in the app for your users? It all starts with the plugins that you choose to utilize within your app. Here we will go through some practical use cases for our plugins and how to get the most out of them. Here’s a sample of the available plugins on Buildfire. With dozens of plugins to choose from, it could be ~kind of~ difficult to select the best ones to use for your app. Below, we’ll go through three different apps (all of which are available as Templates on Buildfire), highlight a few plugins they each feature, and talk about how that specific industry can utilize that plugin for their specific need. Even if your industry isn’t listed below, this article might just spark some creative ideas on how you can use plugins for your app. 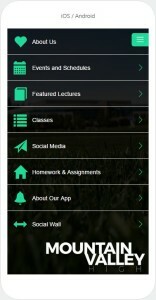 In the education sector, an app is beneficial for the administration and faculty to keep in touch with students and parents. Most notably we’d like to point out the Events and Schedules and Classes. After tapping on “Events and Schedules” on the home page, you’ll be taken to the next screen you see here. This is in the form of a Folder Plugin. This is so we can put in several Events Feed Plugins or Events Manual Plugins, organized here as different sports and academic events. Folders are a great way to organize several different plugins that might have a common theme. In this case, we’d like to organize different schedule by academics and different sports. 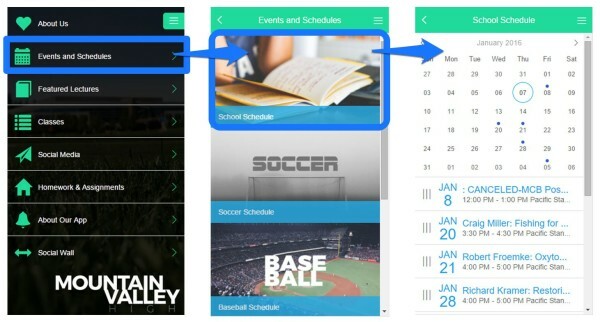 If you tap on School Schedule, or any schedule, then you will be taken to an Events Plugin. Here, you can put in any ongoing school events. For sports events, you’d put in game dates and times. For school competitions, the same, etc. If you use the Events Feed Plugin, you’ll have the option to sync this with a Google Calendar or iCal so any changes made there will automatically update here. If you use the Events Manual Plugin, then you can add and make changes to events on the Buildfire Platform. This format is similar to the Events and Schedules plugin; the Classes Plugin is also a Folder Plugin, to start with. This is so you can store several plugins within this folder that relate to different classes. Art is another Folder Plugin, allowing us to include several aspects related to an Art class such as the syllabus and homework. The Folder can be used in a myriad of ways to organize information. 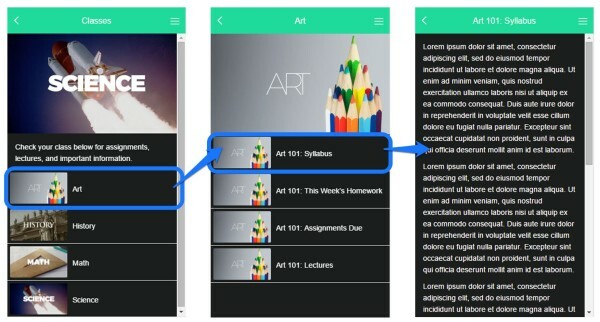 If you tap on the Art 101: Syllabus section, you’ll be taken to the Syllabus screen which is a Text WYSIWYG Plugin. It’s exactly what it sounds like — you can put text in it (as well as videos and pictures too). Text WYSIWYG Plugins are great for when you just need to get simple text information across, such as a Syllabus or an About Us. 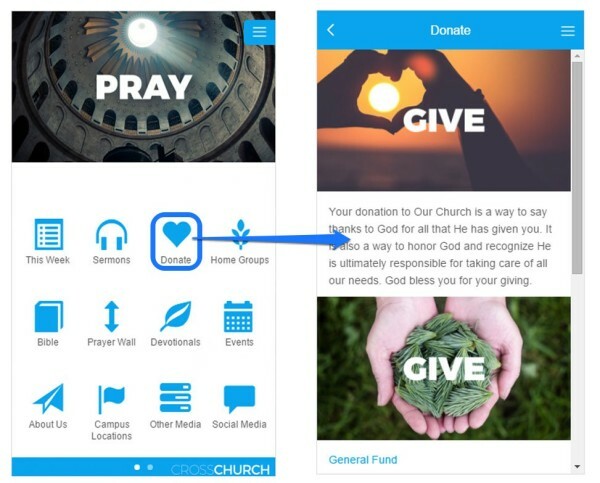 A church can use Buildfire in a multitude of ways in order to keep in touch with their congregation and place resources in their hands. We’ll focus on sharing Sermon media files and how to include Donations below. 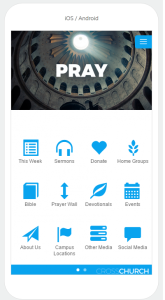 If you tap on the Sermons icon, you’ll be taken to (you guessed it) another Folder Plugin. Here you can use it to store the various Media Center Manual Entries Plugins that include all your Sermons. Let’s tap on Sermon Series One. With the Media Center Manual Entries Plugin, you can add various types of media such as videos or audio. 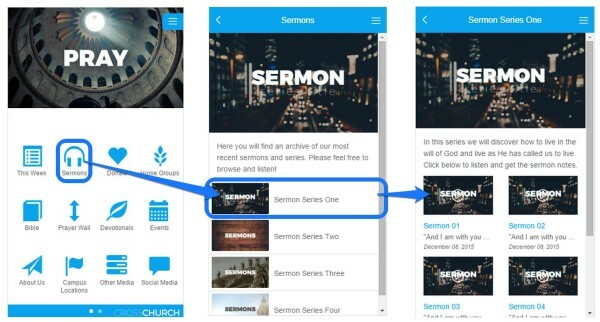 In this case, we’ve linked each Sermon to an audio file so church members can simply tap on one to listen to it. How do you go about setting up donations in an app? Let’s check out the Donate icon. Donate is a Folder Plugin. Within it is some brief text that should introduce the Donations page. Following that are some links to different Plugins that refer to different things your users could donate to. In this case, these plugins are WebView Plugins. If you click to edit a WebView Plugin, this is the page you’ll see. 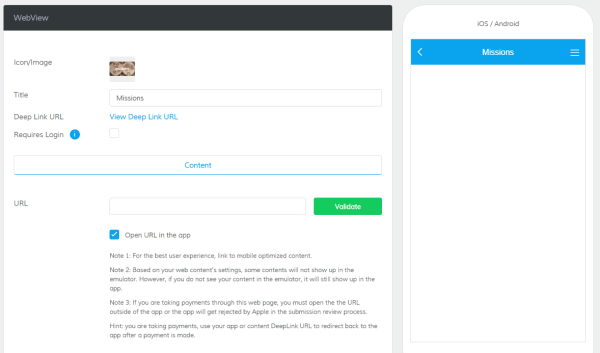 What a WebView Plugin basically does is allow you to open up a website within your app. This is similar to how social media apps such as Facebook and Twitter open up links. You’ll click on a link and be redirected to that page, but stay within the app. Then, you can easily tap a “Back” arrow located at the top left and return to the app. Just paste a link where it says “URL” and click “Validate” to have your Webview Plugin redirect to that web address. Now when your users tap on that plugin in the app, they will now be redirected to this link. Small businesses can benefit greatly from creating a mobile app. 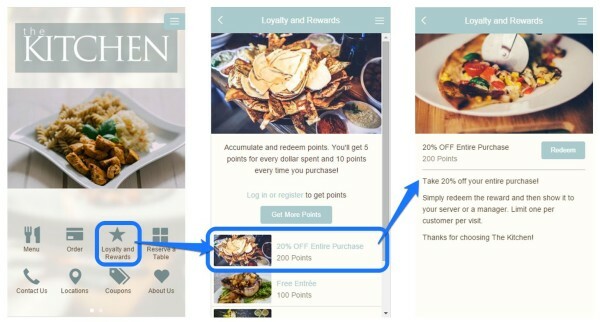 You can reward your users for their loyalty, keep them updated on your menu, and even send push notifications notifying them of any sales, coupons, or specials you’re currently running. We’ll focus on the Coupons and Loyalty and Rewards icons here. Giving out Coupons is a common business strategy. While in the past you’d have to mail, email, or physically distribute them out, now you can send them straight into your customers’ pockets with an app. 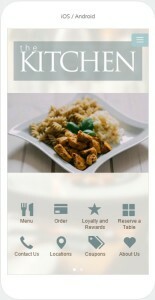 Tapping on Coupons will take you to a Folder Plugin. In here, we can place several coupons that we are running at any point in time. 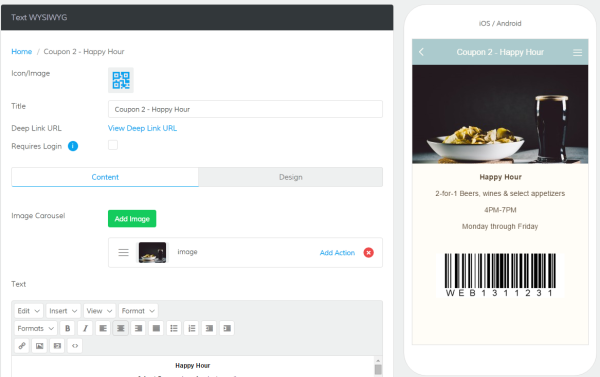 Tapping on the Happy Hour coupon will take you to a Text Plugin that includes a photo representing Happy House, some details on when the coupon will apply, and even a barcode that they can scan in order to redeem it. This is a Text WYSIWYG Plugin, but as you can see, you can also insert relevant images to spice it up. 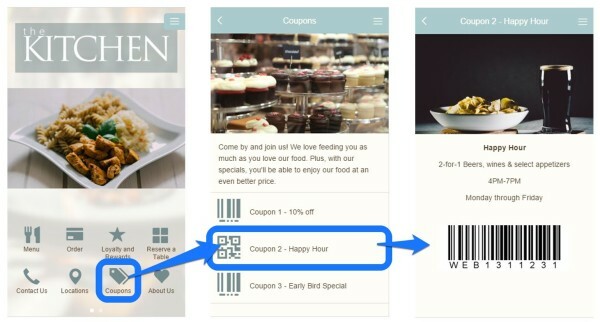 You can even include the coupon barcode right in the text body, ready to be scanned at the register when your customer whips out their phone. Other than your awesome products, amazing service, and delectable food — you’d want to give your customers more reason to come back time and time again, right? One way to do this is to set up a loyalty program that will reward your customers for all the times they’ve decided to eat at your restaurant. This is where Buildfire’s Loyalty Plugin comes in. If you tap on the Loyalty and Rewards icon, it’ll open up the Loyalty Plugin and this is what you should see. Users will have to create an account on your app in order to use this; this creates even more opportunities for you to gather more information on your audience so you can tailor content and push notifications to them. We’ve gone into different types of apps and the tailored Plugins that you can use for each. But are there any common threads to a successful app? We argue — yes! 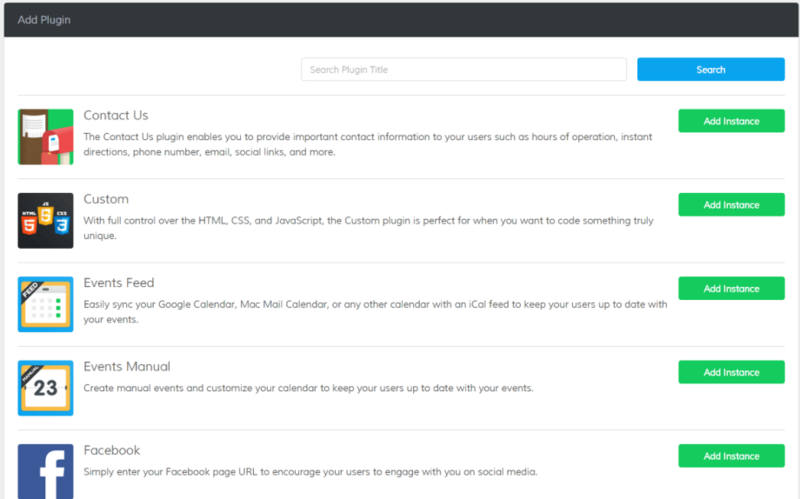 Each of these apps also have different variations of a Social Plugin. Not to be confused with social media, the social plugin keeps your users engaged and communicating in your app. When users perform an interactive action (i.e. 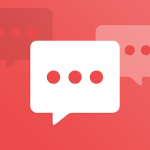 liking, commenting), other users in that group will even get an automated SMARTPush™ notification. Social Plugins are a great tool for your users to not only communicate with each other, but also as a direct means of communication for you. If parents have a question, they can post it on a social wall for you or any other member of the community to ask — instantaneously. You can also post photos as well as text on the social wall. So say a member of your church was on a mission; they could take photos, share it, thank the church members for their donations, then your entire congregation could see their donation money at work. There are tons of ways to utilize this feature in order to further engage your customers and we recommend it as a vital Plugin for almost any industry, company, and organization to use in their app. These were just a few examples to get your brain going and those ideas flowing — it’s up to you to gauge what your customers would find awesome in an app. The only way to test this is to get out there and start building!